Created in 2007 by a group of alternative health professionals, the Wellness Center offers a range of holistic services that take into account the physical, psychological and spiritual dimensions of the human being. Available as individual consultations or group workshops, the services foster self-knowledge and focus on helping each individual access and develop his/her own resources and self-healing skills. Consultations in Jaffray, Fernie and Cranbrook. Please see practitioner's contact info below. An encompassing system of medical care that emphasizes the role of the muscle-skeletal system in health and disease. It focuses on the interrelationship between structure and function in the body, facilitating the body’s ability to heal itself. Francois Amigues, Manual Osteopathic Practitioner D.O., specializes in working with couples, pregnant women and newborns for over 17 years. Francois is president of the Canadian Association for Prenatal Education (CAPE). He lectures and teaches throughout Canada, the US, France and Russia. By understanding the structure of our subjective experiences, we can learn to create the life we want to live. Through deep analysis and fun exercises, we can gain insight into, sculpt, and modify the nature of our beliefs and behaviour. NLP is a technique which allows us to use our past experiences to transform the present. Lubka Amigues has an MA in psychology from the California Institute for Human Sciences. She works as a coach in Neuro Linguistic Programming since 2006, and she teaches Paneurythmy during the summer retreats at IDEAL. Services in Jaffray, Cranbrook and Fernie. Bio-energetic or shamanic care is a method of energy balancing which aims at restoring the circulation of vital energy in the body as well as the proper functioning of the self-healing faculties proper to each individual. Balancing is done by intuitive means, which can be defined as the extra-sensory capacity to apprehend invisible phenomena without the aid of a physical instrument. This method helps to determine the causes of problems by collaborating with the unknown capacities of the human body to heal itself. Energy balancing is a therapeutic method that relies on a holistic approach to the body. It principally consist in neutralizing or suppressing the negative energies that disrupt the etheric body, allowing vital energy to circulate freely by eliminating the causes of many natural problems present or old. Gael Darandovas discovered Bioenergy with Yann Lipnick. For Gael, Bioenergy is a path of liberation that leads to self- knowledge in our multiple dimensions. Intuitive Readings help bring clarity, support and guidance for your questions on career, family, health, relationships or life purpose. Feather was certified with Doreen Virtue for her intuitive abilities in Gold Coast Australia in 2009. She worked internationally at four Healing Centers in Thailand, and one in Singapore from 2009 to 2014. Currently, she sees clients at White Feather Healing Arts Center in Windsor, Ontario, and locally at the Inside Out Wellness Center in Fernie, BC. Breathexperience or Middendorf Breath work was developed by Ilse Middendorf in Germany and is today one of the leading somatic practices in Europe and around Berkeley, California. This practice develops the consciousness of allowing the breath to come and go on its own without the intervention of our will. People come to breath classes because they want to reconnect with their own resources and bring balance and health into their lives. Breathexperience offers a path of integrating emotional, physical, and spiritual aspects of one’s being. Breathexperience is mostly taught in small groups. Students practice and experiment with a variety of different exercises to experience their ‘allowed breath’ in relation to the awareness of their body. Participants are taught either in a sitting or standing position. Breath work can also be experienced in an individual session called “breath dialog". Here the participant lies down on a table. The practitioner through their hands enters into a dialog with the breath of the client. Through this technique the client can experience his/her 'allowed breath' spreading throughout the body. This leads to immediate physical and emotional well being wherein the client feels very aware of peace moving throughout their body. Eliana Kirschbaum is a certified Breath Practitioner who studied at the Middendorf Breath Work Center in Germany and completed her training at the Institute for Breathexperience in California. She specializes in giving Breath Workshops and consultations with pregnant women and couples. Eliana obtained a Masters in Education from the University of Munich in Germany and has 30 years experience in the educational field teaching German, French, PE, Creative Play and Music to individuals and children of different ages in Germany and Canada. She offers her services in Fernie, Jaffray and Cranbrook. EPB is a technique based on the laws of quantic physics used to balance the electric and magnetic polarities in the organism and to reestablish balance. Colored slides which work on the magnetic field of the person are used, giving specific information to the body so it can re-adapt, re-balance and re-organize itself to restore health. DFA is a type of bodywork that improves posture, recognizing old patterns and relieving body tensions and discomfort. SK is a system of light-touch, muscle testing and balancing using principles of Chinese medicine, massage and energy work. 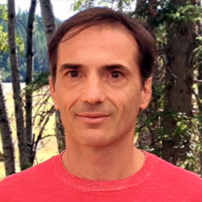 Pierre Tremblay trained in Swedish massage and Specialized Kinesiology & Bodywork. He has been practicing Kinesiology "Touch for Health" and acupressure since 1997. Services in Jaffray and Cranbrook, and at the Baynes Lake Farmer's Market every Saturday during the summer. Filipino healing techniques take into account the physical, psychological and spiritual dimensions of the human being. By channeling a healing energy, the practitioner acts upon the totality of the patient's energetic field, freeing the subtle bodies and centers of unwanted energies and thought forms. Alexandre Velik practices an energy channeling approach developed over the course of many years of study with Filipino healers. Using Filipino healing techniques, he intuitively detects imbalances and blockages in the energetic bodies, which often directly impact the physical body. By channeling healing energy, he frees the energetic bodies of negative energies. This approach helps us explore our prenatal roots, enabling us to re-contact unconscious memories in a relaxed (alpha) state. This therapy helps us re-frame the often negative experiences we underwent as an unborn child and which influence our life on an unconscious level, in order to find a new balance in the present. A doula offers non-medical, emotional support and care to the new mother and family. She helps the mother create a positive experience during pregnancy, birth and the postpartum period.